It is a common norm to maintain the attendance in an automated way nowadays. Be it for your employees at the office or students at the school. No matter the size of your organization, attendance management of your company does play a big role in today's fast-paced business world. And in order to control the attendance in a company efficiently, WordPress attendance plugin is something that you need to use with your HRM system. With some HRM tool, this WordPress Attendance Plugin might come in built-in. But in most cases, you will have to get it as an add-on that you can integrate with your HR module. Getting the WordPress Attendance Plugin with your favourite HR management tool like WP ERP will enhance the ability to keep track of your employees over check in & check out time generating some awesome detailed report. Why Do You Need WordPress Attendance Plugin? In many countries, employees are paid hourly, therefore not being able to monitor the working hours correctly gets the company to lose thousands of dollar every year. This happens due to employees cheating their working hours by forge entering early entries and late exits. Also, they take long extended lunch breaks wasting the working time that they don't even exclude from their productive working hours. This causes companies to face a substantial loss from its earnings each year. But most effectively enough all this can stop and monitor the whole attendance related issues professionally when you decide to use the WordPress Attendance Plugin with your business management tool WP ERP. This plugin very conscientiously records each employees check-in and check-out time providing a complete attendance report with the accurate working hours of each of them. So this enables the HR manager to easily calculate the working hours and provide salaries accordingly counting the hours they actually worked. Not to mention its importance in reducing the workload of the HR manager to generate each employee's overall attendance report. The whole process of your attendance keeping gets automated and are managed in a more organizing manner than ever. So the needfulness of the WordPress Attendance plugin is highly essential for all companies. WordPress Attendance Plugin is loaded with a number of standout features that can surely benefit a company by helping it manage their employee's overall attendance and getting their actual contribution report. The usefulness of the WordPress attendance plugin is highly noticeable. There are quite a few useful things that you can perform with this extension. Some of them are highlighted & discussed below. The first useful thing you get to do is to view an overview of each employees attendance status. This is displayed as a pie chart and can be filtered and view custom period wise. 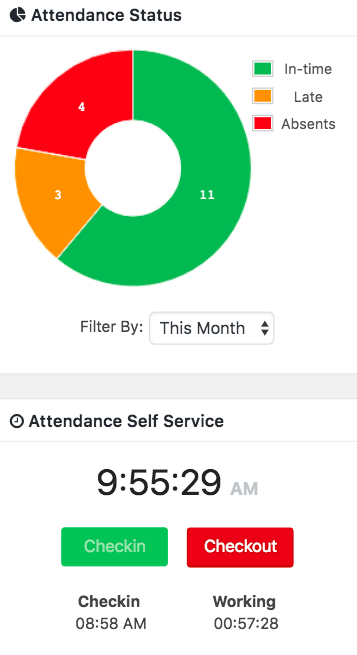 The pie chart of attendance status actually highlights the employee's count of days of in-time entry, late entry and absents separating them in different colours. And below with the attendance self-service, an employee can register the check-in and checkout time in the office. Once an employee checks in, it automatically registers the check-in and starts counting the working hours since then. Once the employee checks out, it stops the working hour counter and registers it on the daily attendance record of that employee. 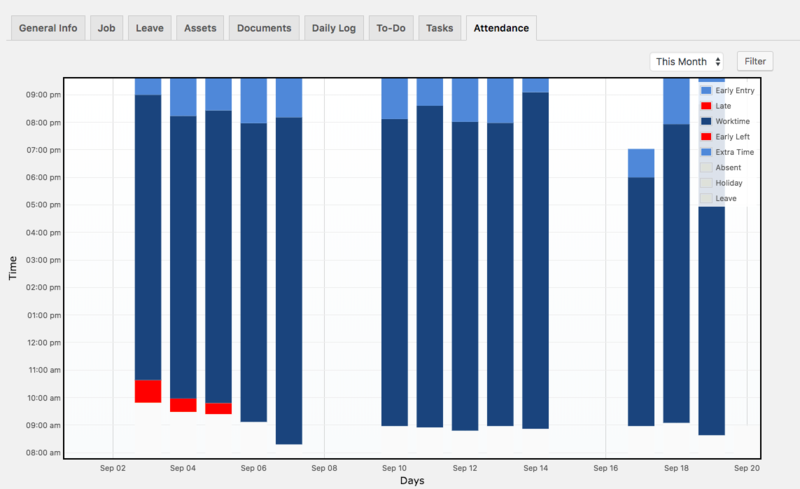 Another nice thing that you get is an overview of each employee's overall attendance column chart. This chart presents each employee's early/late entry, work time, early left time, time extra worked, absent, holiday and leave days. The complete chart is displayed in column format and in different distinguishable colours for easy differentiating and understandings. You will be able to view this column chart for each employee custom day/month/year wise. Another awesome thing that you get is the total attendance summary of each of the employee at one place. Something like the image shown above. This summary generates in real-time and you can view it custom date wise to evaluate the attendance of each employee. If needed, you can also print this full summary to keep it with the attendance report of employees. Something that will be handy while evaluating the performance of your subordinates. For you to use the WordPress Attendance plugin, you will need to own a WordPress site first. For non-WP ERP users, you can simply check out this easy WP ERP setup video below. Here is how WP ERP is different from others in terms of managing your small business. 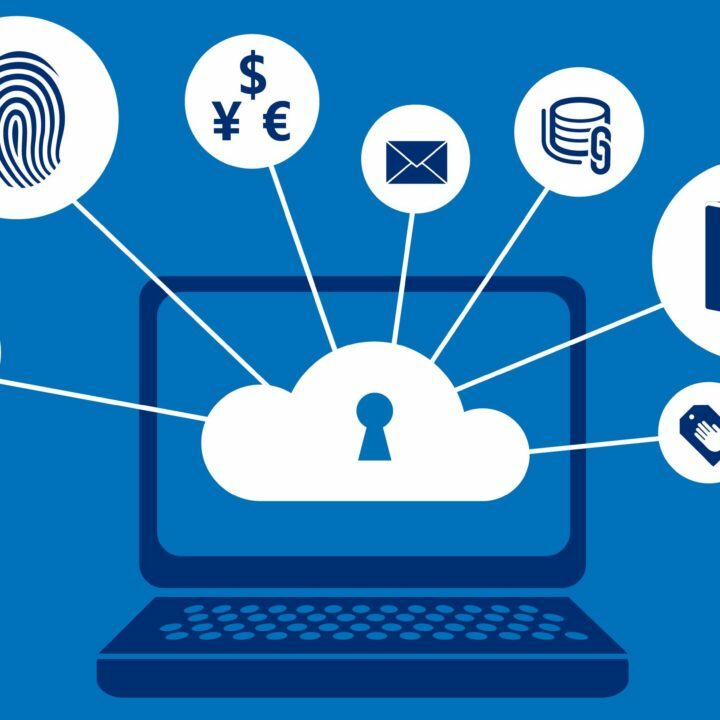 In case you want to read a written documentation of the whole WP ERP installation process, here is the complete setup guide for you. Automate The Attendance Process Of Your Employees Today !! It's not surprising anymore that WordPress Attendance plugin is an imperative part of every HRM system. Though most company's attendance system need is different from one another. So knowing the HRM need and specifications of your company human resources is really important when you look to implement the WordPress attendance plugin. The plugin does what it promises in managing the attendance of your employees, generating a full detailed report of the check-in/check-out time. It displays the complete summary of an employee's attendance details. Working days, the number of days present, holiday counter, leave, absent, late entry of each employee are all available as a summary on the HR management dashboard with this WordPress Attendance Plugin for WP ERP. Not just the attendance extension, as a WP ERP user you get to use a number of useful and powerful add-ons to enhance the functionality of your HRM, CRM and Accounts management system. If you have any queries or feedback regarding any of our WP ERP extensions, feel free to leave a comment below or contact our support team.